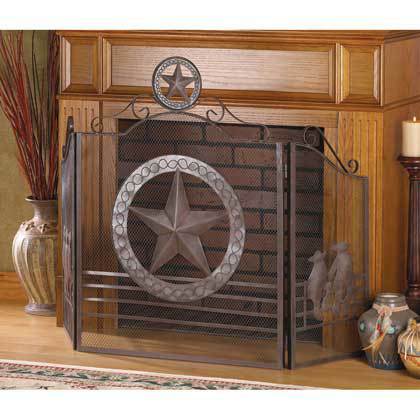 LONE STAR FIREPLACE SCREEN by Accent Plus home decor, jewelry, decor, decorations, electronics, fountains, floor mats, art glass, vases, garden essentials, fireplace screens. Add a touch of Texas style to your hearth with this handsome folk art screen! Striking gate design features a host of metal cutouts and rustic weathered finish; gives any room a cozy prairie campfire feel. Center panel: 26" x 35" high; each side panel is 12 1/2" x 27" high. Material(s): IRON METAL - SHEET METAL - MESH SHEET METAL, MESH METAL. Weight 11 pounds. Dimensions 26" x 12.5" x 35".